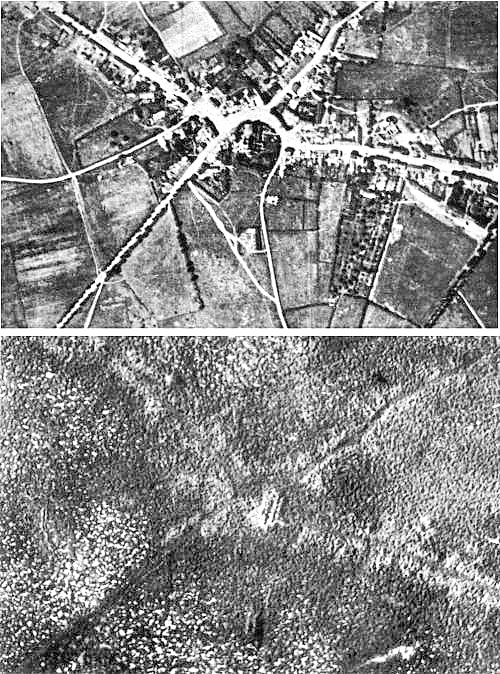 The French shed copious amounts of blood at Verdun 1916, but in 1917 at the Third Battle of Yprès or Passhendaele, named after the Belgium village where the battle was fought, it was the English and Canadians turn to make enormous sacrifices. The Yprès salient was a tactical problem for the Allies, so the offensive was intended to capture ridges of high ground east of the town. 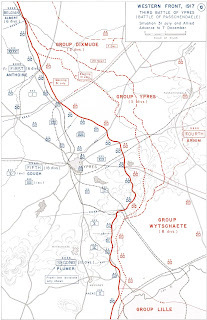 A main rail route passed to the east of the salient that was vital to the German Fourth Army. The Germans had held the salient since the First Battle of Ypres in 1915. Passhendaele was situated at the top of the fourth objective ridge. The Allied offensive continued with heavy losses on both sides into winter. The tactical concept of combined arms was in its infancy; the royal flying corps was undergoing training for close air support. Tanks were just coming into regular use, having appeared en masse to great effect at Cambrai. German fortifications had to be taken by frontal infantry assaults. The strategic rationale for the offensive was in part a diversion to allow the French army, still reeling from mass casualties at Verdun and subsequent mutinies, to recover fighting strength. Another strategic goal of the Yprès operation was to flank the North Sea coast so German submarine bases could be destroyed or captured. The Germans by then had begun unrestricted submarine warfare which was hurting the Allied trans-Atlantic supply lines. But the Flanders campaign was controversial at the time and has remained so since; both David Lloyd George and General Ferdinand Foch opposed it. 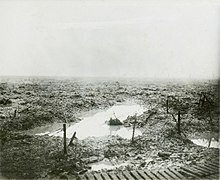 In his Memoirs of 1938, Lloyd George wrote, "Passchendaele was indeed one of the greatest disasters of the war...No soldier of any intelligence now defends this senseless campaign..." By the premature end of the operation in the winter of 1917, German U boats were still sinking Allied shipping in the North Atlantic, even though the French army had restored discipline and brought replacements forward. Exhausted imperial soldiers had to also fight the incredibly muddy terrain churned to a gelatinous mass by repeated heavy shelling in very wet fall weather [photo, right]. Casualty figures have been repeatedly disputed by historians. No one can argue they were not extremely high. By the time the Canadian Corps captured the ruin of Passhendale (see photo above) on the fourth ridge, over a quarter million Allied soldiers had died or were wounded. Germany lost perhaps twice that many, but could ill afford a war of attrition with the Allied army newly reinforced by the American expeditionary force. 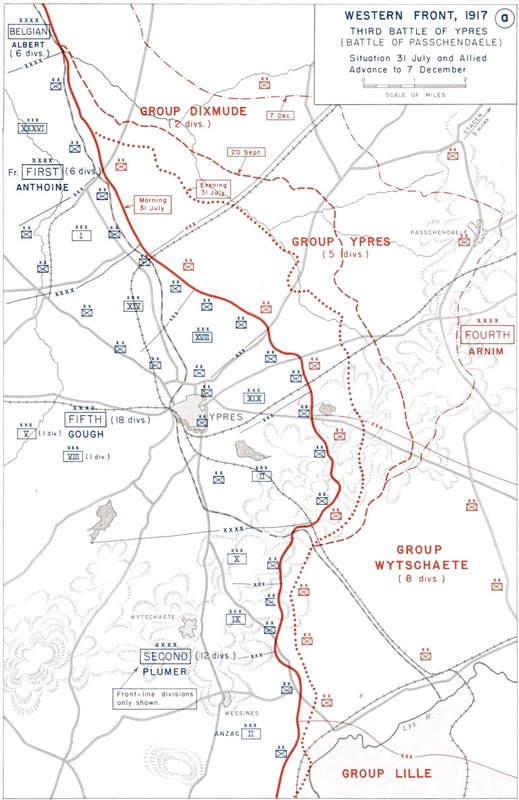 British Fifth Army General Gough's plan was to proceed to Westrozebeke, but because the Germans scored a major victory over the Italians at Caporetto, Allied troops were diverted to Italy in support, and the advance was stopped short of the objective. 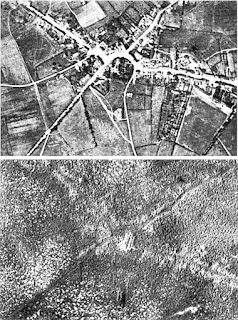 The last major British attack at Yprès was made in November, 1917, the third year of the "war to end all wars."